The Champions League action will return next week with the first leg of the last-16 knockout rounds. Real Madrid will clash against Napoli first at the Bernabéu and later in March at the San Paolo stadium, in Naples. The "warmup rounds" in the Champions League are long gone and it's now time to face the bigger challenges we've all been waiting for. Real Madrid, the reigning European champions, are looking to become to the first club ever to win back to back Champions League titles. In order to make a step in that direction, the Merengues will first need to overcome Napoli, their next opponent in the tournament. The Italian side are far from being an easy draw for Zinedine Zidane's men and thinking otherwise will certainly dictate a premature elimination. The first leg takes place on February 15 at the Santiago Bernabéu and the return leg will be played in Naples, on March 7. Fasten your seat belts! Real Madrid may have gone 40 games unbeaten recently, but they saw their run coming to an end last January and are not looking as solid as they were before. Ironically, it's Napoli who are now building their own unbeaten streak and their record has gone up to 17 games already. Can they manage to keep their run alive through the two ties against Real Madrid? Real Madrid only lost twice this whole season and even though those upsets may have happened recently, it's always a positive stat to look at in mid February. However, Napoli haven't been beaten that many more times... Maurizio Sarri's men only left the pitch with the bitter taste of defeat in 4 different occasions. That happened against Atlanta, Roma, Besiktas and Juventus. Hopefully, Real Madrid will add their name to that list. He's the team's captain and he's in our opinion Napoli's best and most decisive player. 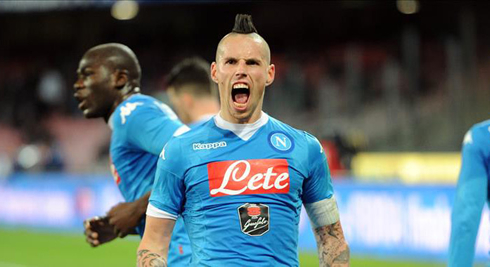 Whether or not Hamsik will be capable of leaving his mark in these 2 games against Madrid, it's obviously hard to predict. 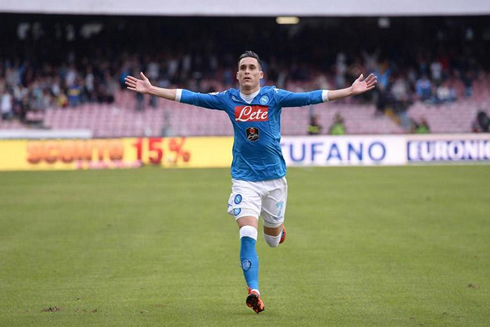 But make no mistake — he's the danger man for Napoli. They're second in the league, but when it comes to scoring goals, shooting, passing and possession, they're second to none in the Serie A. They already scored 55 goals (the league leaders Juventus are second on that, with 45 goals), they total 406 shots, 13.250 succesful passes and they average 61.54% of ball possession. Cristiano Ronaldo next game is a La Liga fixture, on February 11 of 2017 against Osasuna. You can watch Juventus live stream, Osasuna vs Real Madrid, Barça vs Atletico Madrid, Manchester United vs Watford, Leicester City vs Derby County, and Bayern Munich vs Wolfsburg, all matches provided from our football live game pages.